​I didn’t want to admit it, but my sister’s words hurt. Three months and two sizes after ordering a prom dress that fit perfectly in January, I stood in front of the mirror, my sister holding the two sides of my dress together while my mom struggled to yank the zipper upwards. It remained unzippable. “You grew even more,” my mom said – not in the proud-mother way you might expect, but in a “I guess I’m proud that you rock-climb but I regret that it’s at the expense of your feminine physique” tone. Was the dress too small? Or was I too big? The first time I practiced with the City Beach Recreational Youth Climbing Team the summer before freshman year, I felt anything but strong. I fell on the second move of a V0 (the easiest bouldering level) traverse the coach had us warm up on, and while eight-year-olds pumped out ten pull-ups at a time, I struggled to do one. By the end of the practice, I felt partly humiliated, partly exhausted, and mostly in love despite and because of it all. I decided to go to the next practice for the same reason I went to that first one: if I worked at this, I could potentially be good at climbing. I might not be the best, but I could be the most improved. One practice led to another, although it never got easier. My improvement was hardly linear, and after I began training eight hours a week to climb competitively, I rarely placed in the upper half at competitions. Making time to climb even when it didn’t translate into impressive results gave me a confidence I didn’t know I could have by reminding me why I climb. 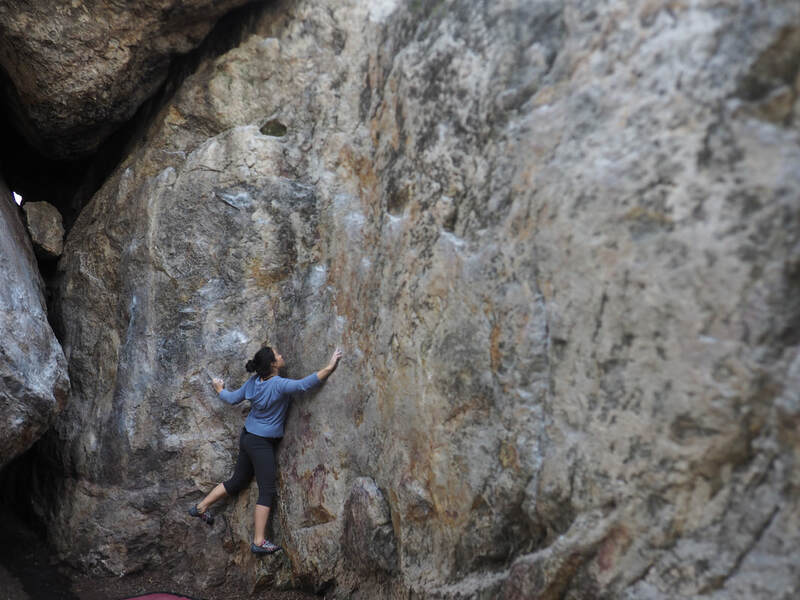 To a more accomplished climber, climbing might be about qualifying for nationals, or finishing an impossibly difficult V10 outdoors, or “flashing” a bouldering problem by finishing it on the first try without falling. For me, though, climbing is doing 15 pull-ups and remembering what it was like to be unable to do one; it is falling over and over again on the same move of a V6, only to remember what it was like barely being able to start a V0 two years earlier. It is wishing I started climbing earlier and then being tapped on the shoulder by an older climber who just wanted to tell me, “Hey, you’re really good. I wish I started climbing when I was your age.” It is waking up too sore to move a muscle and realizing it’s because my body is already stocking up on more. It is growing out of my old clothes because I am growing into a person that I want to be. In the end, it wasn’t that I was too big; the dress was just too small, and that was okay. I didn’t spend three years building strength just to zip myself into some idealized standard of what I “should” look like. I take pride in the fact that my love of climbing is defined neither by competition rankings nor my dress size, and why should I be ashamed of what I’m most proud of? My #lauramuscles were built to be flexed, and if it takes a custom dress size to accommodate my growth – physical, mental, and emotional – then so be it.